RUSH: Gary in Cincinnati. People have been waiting a long time. And you're up, Gary. Great to have you. How you doing, sir? CALLER: I'm doing just great, Rush. On the subject of John McCain, Senator McCain, I'm not a fan. 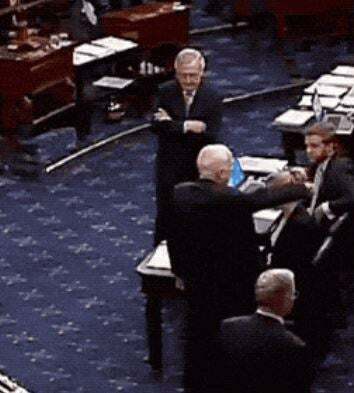 It seems like he went from being a courageous, honorable young Navy pilot to being a bitter, petty old senator. And I'm just really sick and tired of media and politicians telling me who I have to like, what I can think, and what I can say. That just about sums it up for me on Senator McCain. RUSH: So let's make it clear for people who didn't understand. You don't like being told what to think about people, so what do you think? CALLER: I think Senator McCain was a phony. He just voted wrong on so many bills and that. I mean, he would go one way -- I'm a Republican. He would build my hopes up and he would shoot it down every time. And I just didn't have no respect for the man. I don't care what anybody else thinks about him. They can think the whatever they want to. But for me, nobody can tell me any different. RUSH: Well, we're in a circumstance, and here again we have a cultural mandatory viewpoint that has surfaced, and you've just described it. The cultural mandate is that John McCain was a hero, period. John McCain sacrificed so many years of his life for this country, and you haven't, so, A, shut up. John McCain was a hero. He was in the Hanoi Hilton. He was tortured worse than we tortured people at Abu Ghraib. He was humiliated and tortured, broke his arm, and they offered him early release when they found that his dad was Admiral John McCain. And he refuted that release because they weren't gonna release his cell mates, and as long as his cell mates stayed, he was staying. So he's a bigger hero. He refused the opportunity to get out of the Hanoi Hilton. And so this became the identity that John McCain came back to the United States with. An American hero, an American military hero, great valor, United States Naval Academy. And this is what we all must believe. It has been mandated. And if you stray from this, if you have any kind of alternative view, then you are the one that we're gonna focus on with the problem. How dare you, how dare you be so insensitive? What have you done for your country? You can't approach one day of John McCain's life. And they shame people into either being quiet or acquiescing to the established reputation or image. And that image gets burnished as McCain comes back, marries the Budweiser distributorship heiress in Arizona, acquires some wealth, runs for the United States Senate, becomes one of the most powerful members of the Senate, promises to lower cable bills every time his committee has a hearing, the bills kept going up, but he tried. All the while burnishing the reputation of American hero and great, great, great patriot. (interruption) Well, the Keating Five, you kinda don't bring that up, you don't allow the Keating Five scandal to interfere here because the narrative, if you will, or the reputation has been created. The Keating Five was a scandal that McCain was involved in, a fundraising scandal, and he was trading fundraising deals for a guy name Charles Keating. Charles Keating became the bad guy who tricked McCain and others in the suit unwittingly went along. It was an unfortunate stain on the great, heroic life and career of Senator McCain, and he forever regretted it and apologized and he made amends for it, came back from it. So then he decides to run for the presidency and the burnished reputation prevails. McCain's primary support base became the American mainstream media, at first. But regardless, throughout McCain's political life and career, that reputation or that image -- and I'm not saying it's phony, don't misunderstand. But it got so burnished that there was this forced acceptance. So our caller here, “I don't like being told what I have to think, especially by these people in Washington. I don't want to be told what I have to think. I have the ability to come up with my own opinions and attitudes about these people and I don't want to be force-fed and demanded that I feel a certain way. Nobody's gonna tell me any different,” he says. McCain was so insulted, and it stuck. I think it happened at Bob Jones University or something. It stuck. It was in a South Carolina primary where the ruling class Bush family put this news out there, the Bush campaign. And it was said to be one of the reasons McCain lost in the South Carolina primary, ended up losing the presidential nomination. I remember there were news media people, remember McCain's bus, the Straight Talk Express, he's driving around in this bus and I can't tell you the number of Fox News people that got a trip on the bus, two or three days, spent time with McCain, visited him on the campaign trial, come off the bus, "My God, what a man. Oh, my God. I had no idea. He's even greater than I had been led to believe. This guy, oh, my God!" And they became instant believers in John McCain. And you could not, you, me, you could not utter a critical word, even if it was about policy. Does this guy really think the media's not gonna turn on him? “No, the media will not, Rush. This man is, oh, wow, what a hero.” They just would not tolerate any disagreement or opposition. Anyway, I gotta take a break here in the middle of this fascinating recounting of history. RUSH: Okay. Now, let's come to the current era with John McCain. After reliving some of the history that led to the creation of his reputation and image, John McCain -- these are my words, so if you have a problem with it, you can direct them to me -- John McCain passed around a political smear job that was paid for by Hillary freaking Clinton. John McCain, Republican, did everything he could to undermine the Republican presidential nominee, Donald Trump. Russia, a distinct enemy of the United States, created, helped create this phony smear job document. John McCain led the effort to get it circulated in Washington, D.C. Talking here about the Steele dossier. Russians created it, Hillary Clinton paid for it, Senator John McCain is helping spread it throughout the United States media and the Washington, D.C., establishment. What became of that dossier and what did McCain want by spreading it? He wanted to destroy the Donald Trump presidency. Remember, this is happening after Trump has won the election. John McCain dispatched an aide to the United Kingdom after he heard about this to actually get a hard copy, he made sure to dispatch an aide -- he didn't go himself -- he fed it to, among other people, James Comey. And this document, fraudulent and phony and lie after lie after lie from beginning to end, was used to run a silent coup against a duly elected president. It was used to corrupt and befoul America's domestic political system for two years and counting. Vladimir Putin got exactly what he wanted thanks to people like McCain. He wasn't alone. There were all kinds of people trying to sabotage Trump's presidency, but McCain was one of them. May he rest in peace. That dossier has damn near led to a coup. It has done incalculable damage to this country, not just to Trump, but to the country. It's done damage to the media that they don't know yet. It has done damage to our intelligence agencies. It has done damage to Hillary Clinton and Barack Obama. It has damaged the credibility of the entire United States system of justice! It was financed by perhaps the most corrupt politician to ever run for president, Hillary Clinton. It was used to falsely portray Donald Trump as a traitor! A traitor, in all caps! Somebody they said who sold out his country, when it was Hillary Clinton all the while selling America's policies to the highest bidder. This happened on the watch of Barack Hussein Obama. And the vote that McCain gave thumbs down on Obamacare was a disaster. The dossier was a gift to Putin. His Obamacare vote was a disaster. None of that can be denied. You can make of it whatever you want, but none of that can be denied. Every bit of that happened. RUSH: Now, for any of you who were with me the previous hour, the conclusion of the previous hour some of you said, "Wait a minute, Rush! Wait a minute. How do you know McCain did all that?" A, it's widely known and McCain was proud of it. And that thumbs-down vote on repealing and replacing Obamacare? There's been no question! You know, McCain had campaigned for reelection on an anti-Obamacare position, and he had assured everybody that he was gonna vote for the repeal and replace. He had assured the White House. Matt Schlapp, who was counting votes in the White House, told everybody that McCain had told them over and over again. But with McCain, they never knew. He had told them that he was gonna vote to repeal and replace it. And the Democrats gave him the last vote, and he stood up, looked around -- very defiant expression on his face -- and did that famous thumbs down, thumbs down. 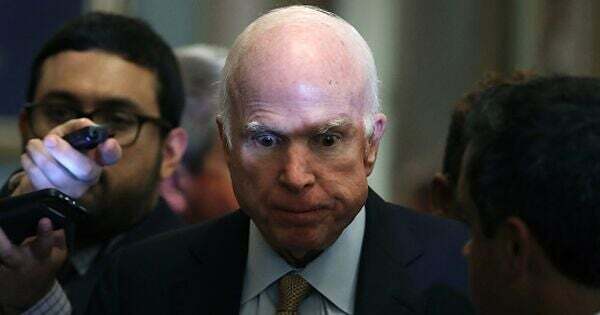 And many people knew that this was Senator McCain payback for his outrage and anger at the things President Trump, Donald Trump had said about him over the years. And I remember somebody called and said, "Senator McCain, this is really petty," and even that was greeted with, "You can't -- you can't call an American hero 'petty'! He doesn't do anything petty! That was serious consideration that went into that vote." Okay. Okay. Here is the story from the Epoch Times. "Deposition Reveals Late Sen. McCain’s Role in Spygate Scandal." David Kramer is the name of McCain's aide. "David Kramer, a longtime associate of the late Sen. John McCain (R-Arizona), revealed in an unsealed deposition that he had contact with at least 14 members of the media regarding the Steele dossier -- a collection of 17 memos containing unverified allegations against Donald Trump. "Additionally, Kramer gave a full copy of the unverified dossier to then-Senior Director for Russian Affairs at the National Security Council Celeste Wallander, Rep. Adam Kinzinger (R-Illinois), and then-House Speaker Paul Ryan’s chief of staff, Jonathan Burks. Kramer also provided a briefing in early December 2016 on the dossier to both Wallander and Victoria Nuland, then the assistant secretary of state for Europe and Eurasian Affairs. "Kramer also provided ongoing updates to Fusion GPS co-founder Glenn Simpson," who didn't need any updates because he was part of the authorship of this thing! But it didn't matter. McCain's aide was still updating Glenn Simpson, and Steele himself, as well as "other members of the media regarding McCain’s meeting with FBI Director James Comey." So McCain had a meeting with Comey talk about dossier, and McCain's aide is telling all these people what McCain told Comey! Now, "Steele had been hired by Simpson on behalf of the Clinton campaign and the Democratic National Committee (DNC) to produce" this stupid dossier! Now, McCain -- and you may not know this. "McCain famously denied ever providing a copy of the dossier to BuzzFeed, telling the Daily Caller on October 18, 2017: 'I gave it to no one except for the director of the FBI. I don’t know why you’re digging this up now.'" Yeah, he didn't. McCain didn't give the dossier to BuzzFeed. His right-hand man did. This is all part of the program called "plausible deniability." You can make of it whatever you will. Donna Brazile spoke out in favor of Senator McCain on Fox News the other day. She's become his biggest fan as a new commentator on Fox News. But do you remember...? You may not. Let's see. What is the...? Well, we'll get the right date here. The point is that when McCain was alive, Donna Brazile was trashing him left and right. "Donna Brazile began by criticizing Trump," this is on Fox, "for speaking ill of the dead. She said John McCain 'leaves a legacy of sacrifice. He should be honored for his service.'" But in 2014, Donna Brazile tweeted a hit piece on McCain. "The Vacant Soul of Senator McCain," she titled it. "The Vacant Soul of Senator McCain." Well, she didn't write that. She tweeted it, retweeted it, "called it 'an interesting article.' The article was in response to McCain's criticism of Obama for the Bowe Bergdahl prisoner swap in which the U.S. freed five major Taliban terrorists from" Gitmo. McCain criticized the deal and so forth. The point is that all these people who are singing McCain's praises, many of them have in the past been typically politically critical of the guy. Donald Trump went to Ohio yesterday and tried to explain to everybody what this is all about. He went through the list. Grab sound bite numbers five and six. He was in Lima, Ohio, and he quadrupled down on this McCain business. Let's just listen as Trump tries to explain to the audience there and to the media why he is continuing to say the things about McCain that he is. THE PRESIDENT: A lot of people are asking. Because they love me, they ask me about a man named John McCain. If you want to tell you about it, should I or not? THE PRESIDENT: Yes? What? So I have to be honest. I've never liked him much. Hasn't been for me. I've really... Probably never will. But there are certain reasons for it, and I'll tell you -- and I do this to save a little time with the press later on. John McCain received the -- a fake-and-phony dossier. Did you hear about the dossier? It was paid for by Crooked Hillary Clinton. ? THE PRESIDENT: Right? And John McCain got it. He got it. And what did he do? Didn't call me. He turned it over to the FBI hoping to put me in jeopardy. RUSH: Okay. Now, let's play arbiter here, and let's just get your thoughts on this. So starting in 1999, McCain comes under criticism of Trump for being captured. Obviously, Trump -- for maybe reasons that we don't know -- had a problem with McCain being automatically granted hero status. And -- who knows -- for whatever reason didn't like it, didn't think it was warranted or justified (who knows why) and began publicly saying that he doesn't respect military people that get captured and that he doesn't think that people who get captured should automatically be proclaimed heroes. After watching the McCain funeral, I'm convinced that McCain never was able to forget this. It ate away at him for the rest of his life, and he based much of -- not all. But he organized much of his funeral and the eulogies around subtle digs at President Trump. And then, in his one substantive efforts, one substantive opportunity for payback, John McCain sabotages Trump's effort to repeal and replace Obamacare with now the famous thumbs-down vote on the floor of the U.S. Senate. So Trump is really mad about that, and he's really mad that McCain was spreading the dossier around. Trump's point is, "Look, if he runs across something like this and it makes him seriously consider that maybe I've been compromised and maybe the Russians have their hooks entomb, why not come tell me? Why go to the FBI? Why go...?" In fact, nobody in the FBI went to Trump. If they had found a spy in the Hillary campaign, they would have told her. They would have tried to root it out. The FBI was trying to plant spies in the Trump campaign. THE PRESIDENT: I endorsed him at his request and I gave him the kind of funeral that he wanted -- which, as president, I had to approve. I don't care about this. I didn't get "thank you." That's okay. We sent him on the way. But I wasn't a fan of John McCain. So now what we could say is now we're all set. I don't think I have to answer that question, but the press keeps asking, "What do you think of McCain? What do you think?" Not my kind of guy. But some people like him, and I think that's great. 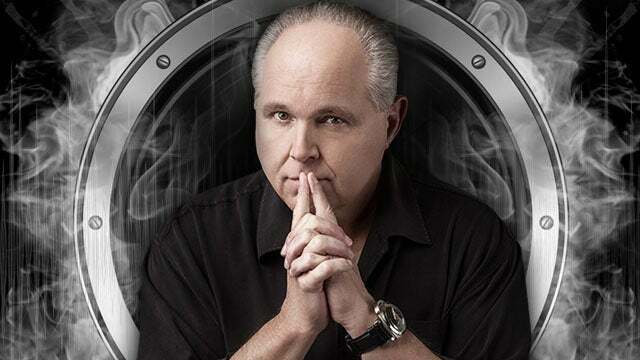 RUSH: It's very obvious that we have a man in President Trump who will pretty much answer whatever you ask him here, and he won't hold back. Some people find it refreshing. Some people say, "This is exactly what we don't need. We need somebody more diplomatic who doesn't make these kinds of gaffes." But here's Trump. He says, "Look, I gave them the funeral they wanted. He wanted a presidential funeral." Let me say something here about this. 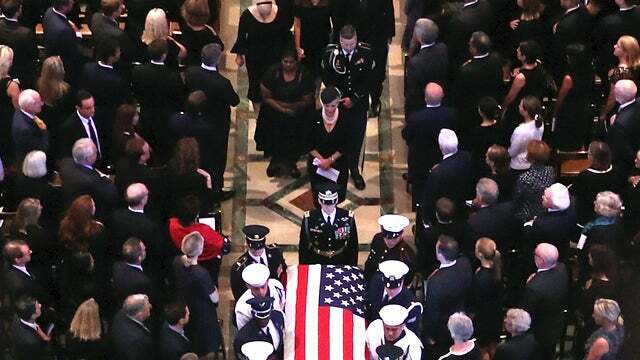 John McCain did get a presidential funeral that senators do not get. They don't. Senator Kennedy may be the closest to having gotten a presidential funeral, but it bombed. It didn't draw nearly the crowds that they all thought it would. It was dwarfed by the Reagan funeral. But Trump... The McCain family wanted a presidential-type funeral. In fact, all the networks were talking about this as they covered it, that McCain received a funeral for an office he never succeeded in holding or winning. So Trump is saying, "Look, I gave them everything they wanted. I gave them the funeral they wanted, and nobody said 'thanks.' Nobody said 'thank you.' Instead, they ended up trashing me." RUSH: Okay. 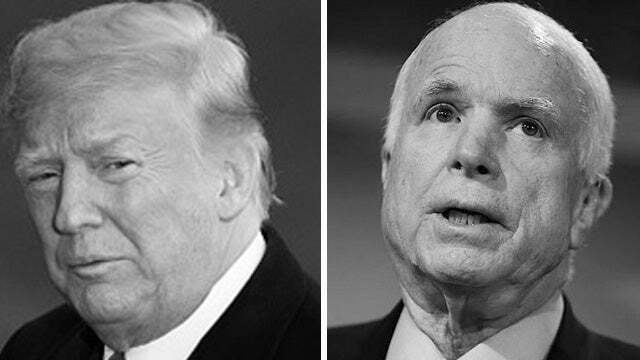 Try these questions: "Did Donald Trump help (and endorse) John McCain win his Arizona Senate race despite the fact McCain was dying of a brain tumor and could have stepped down?" 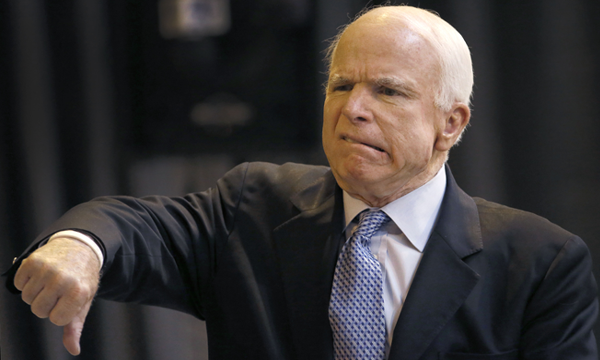 "Did McCain campaign to end Obamacare?" "Did McCain promise to vote for repeal and then grandstand by not doing so?" "Did McCain backstab and play a major role in a silent coup on Trump." "Did McCain announce that he didn't want Trump at his funeral?" "Did Trump let McCain's family use Air Force Two, the big one, to transfer McCain's body to D.C. and give him a presidential funeral?" But Trump is the bad guy?